My SIL introduced me to this great health/fitness blogger. She is a fitness instructor and health fanatic. And she posts some awesome recipes. 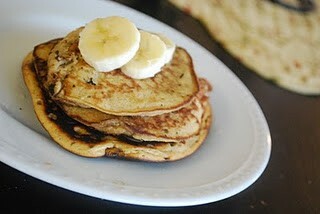 I love these simple, easy pancakes. They are so good you don't even need syrup! 1. Blend all ingredients and cook on a hot griddle.